How & Why did the chicken cross the road? How & Why did the chicken cross the road? By looking both ways before using the crosswalk to safely get to school, of course! In May, sidewalks were busy with parents and children walking to school. 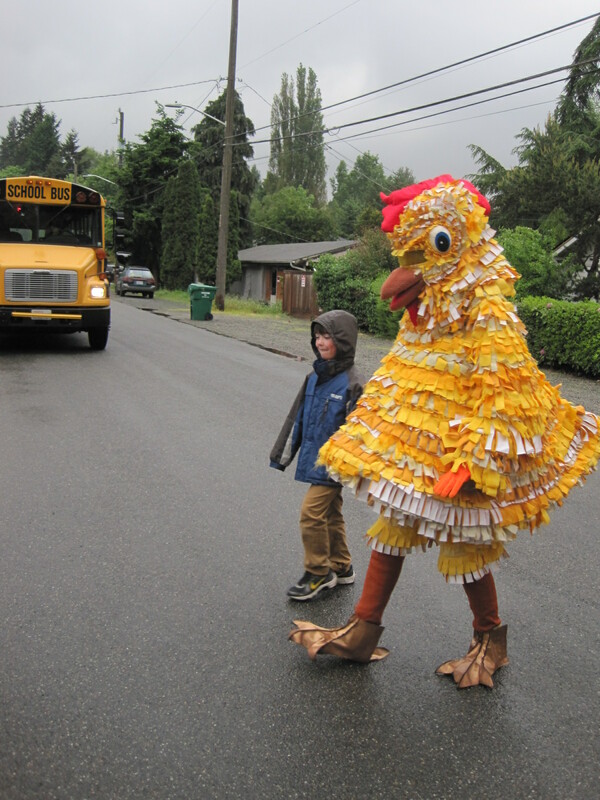 In the four schools working most closely with Feet First, almost 200 students followed the chicken’s advice and walked to school via the coolest mode of transportation – a Walking School Bus! 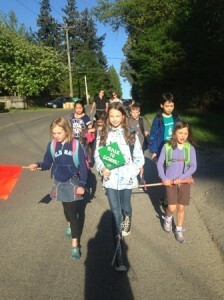 Other schools were inspired to track their walking school bus activity through our first online challenge with Luum.com, and still more schools reported in about their grassroots inspirations and events. I LOVED walking to school in May and have continued it into June as well. I have been talking about trying to put together a walking school bus for two years now but I was worried about over-committing myself and my family. While our walk is only about 1.5 miles, it seemed like a lot to accomplish before school. But it definitely became addictive and I honestly feel like the kids arrived happier, more refreshed and far more ready to start their day. And it was great to get all the other students on the ‘bus’ and keep all those cars off the road (we’re not provided actual bus transportation). The best part? Our driving carpool was late very often. Usually only by a minute or two but enough for a tardy mark. With the Walking Bus we’ve been early every time! 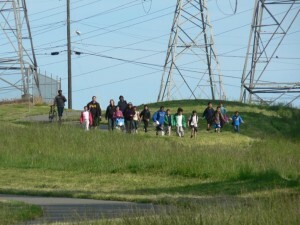 The goal of a walking school bus is to make walking and biking to school safer and easier by bringing people together. 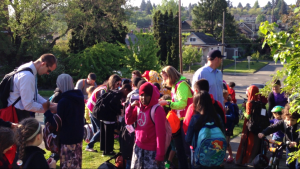 Each of our grant partner schools (Roxhill, Olympic Hills, Hawthorne, and Dearborn Park Elementaries) had three WSBs traveling to school once a week in May. The buses ranged in size from small and efficient with 3 students, to large and energetic with 35. Each WSB was led by either parents or teachers, and on occasion they were joined by a special guest: the Feet First chicken. 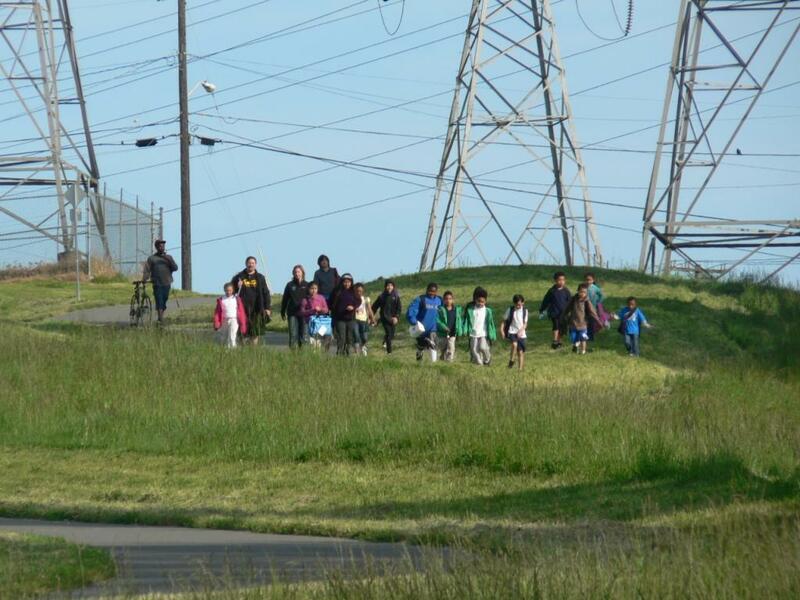 The multitude of benefits of a WSB include: a safe and visible walk, opportunities to teach pedestrian safety skills, brain-fueling exercise – and all before the bell rings! This October is International Walk to School Month and will be a perfect opportunity to start up a walk-to-school campaign at your school. 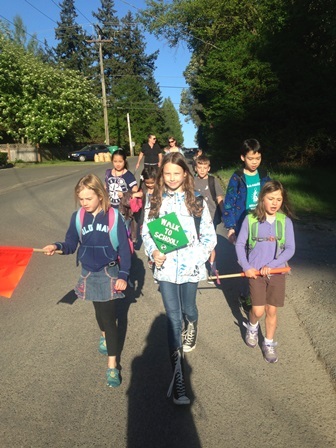 If you are interested in establishing Walking School Buses at your school, please contact Jen Cole: jen@feetfirst.org 206-652-2310 ext. 2.